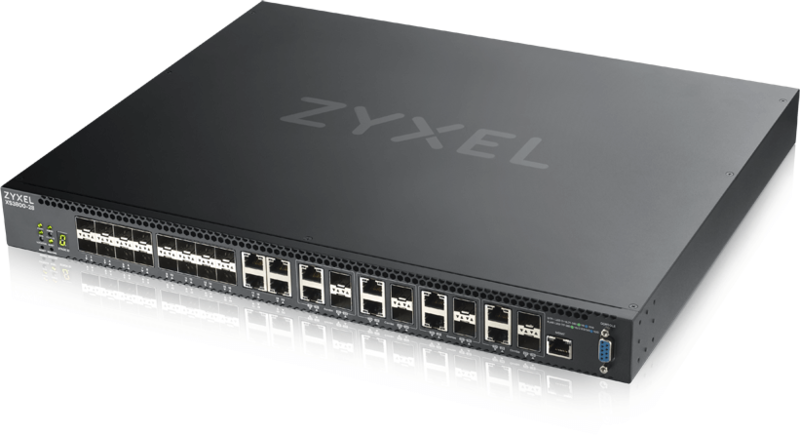 Designed for SMB with 10GBASE-T connectivity and advanced L2+/L3 lite features, the new Zyxel 10-Gigabit L2+ managed switch XS3800-28 enables applications for aggregation or SMB core switching and connection; and the XS3800-28 also comes with up to 12 Multi-Gigabit ports to help your preparation for network expansions with Multi-Gigabit capable devices such as servers, workstations and NAS. 10GBASE-T and 10-Gigabit SFP+ are essential to a Layer-2 aggregation switch. The XS3800-28 offers a wide range of combo ports options to give you the greatest flexibility for any type of networks. With 16 x 10G SFP+, 8 combo ports (Multi-Gigabit RJ-45/SFP+) and 4 Multi-Gigabit RJ-45 ports, the XS3800-28 offers a maximum of 24 10G fiber ports or 12 10G copper ports that are well prepared for easy adaption to your networks. If you are currently connecting a Multi-Gigabit capable device to a traditional 10-Gigabit switch without Multi-Gigabit capability, the connection automatically downgrades to 1 Gbps since your Multi-Gigabit device only supports speeds up to 2.5G or 5 Gbps rather than 10 Gbps. Instead, the XS3800-28 offers up to 12 Multi-Gigabit RJ-45 ports that support 10G, 5G, 2.5G and 1G speeds that allow the connection to operate at the maximum speed as fast as the connected devices allow. The most commonly used CAT5e Ethernet cables support both 2.5G/5 Gbps Multi-Gigabit operations without the need to purchase expensive CAT6 cables. For the existing networks that need to be upgraded to the Mutli-Gigabit specification, the XS3800-28 is the perfect solution without replacing the current cabling infrastructure. Designed with supports to the 4K L3 forwarding table and 1K static L3 routes, the XS3800-28 is suitable for aggregation and virtualization for SMB or campus networks that require low latency and high-density 10G backbone architectures with basic routing capability. As a SMB core switch, high availability for uninterrupted services is essential. The XS3800-28 comes with two PSUs supporting active-standby power redundancy that triggers backup power supply if the main unit fails. The XS3800-28 also features a new one-touch “Restore” button on the front panel that saves the last workable configuration as the custom default, which allows you to fall back anytime with a press in case of network misconfigurations. Download the Zyxel XS3800-28 Datasheet (PDF).